Spinal Epidural Abscess (SEA) is uncommon and rare condition in immunocompetent population and even more rare in pediatric group. The incidence of spinal epidural abscess appears to be increasing and comprises up to 2 per 10,000 hospital admissions. The presentation is variable and diagnosis can be easily missed on ﬁrst visit. The diagnosis is established by history, clinical examination finding, increased inﬂammatory markers and neurological imaging. Surgical decompression and drainage in combination with antibiotic for four to six weeks are the typical treatment for SEA. An alternative treatment with parenteral antibiotic only is an alternative treatment. We reported an 11-year-old girl presented fever, chest and back pain she was found to have unsteady gait and lower extremity weakness. Spinal MRI showed heterogeneous enhancing collection in the posterior epidural space from the level of T2 vertebra to T10 vertebra. She was treated with antibiotic for 6 weeks without complications. Spinal Epidural Abscess (SEA) is uncommon and rare condition in immunocompetent population and even more rare in pediatric group. This is unusual bacterial infection that require prompt diagnoses and early intervention to prevent devastating neurologic sequelae [1,2,3]. Spinal epidural abscess usually occurs in subjects with risk factors including diabetes mellitus, cancer, advanced age, immunodeﬁciency, chronic renal failure, alcoholism, intravenous drug abuse, neurosurgical intervention to spine, acupuncture or mucocutaneous trauma [2,4-7]. Predisposing factors can be absent in around 10-20% of SEA patients [8-10]. The access of bacteria to spinal epidural space can be through contiguous spread, hematogenous dissemination or the source of infection is unknown as it is stated in 20-40% of previously reported cases [2,8,11-14]. The most causative agent of SEA is Staphylococcus aureus followed by Gram negative bacteria, Streptococci and anaerobic bacteria [2,8,11,14-16]. The presentation is variable and diagnosis can be easily missed on ﬁrst visit . A triad of back pain, neurological deﬁcits and fever is the classic presentation of SEA. However, only a few number of cases present with the classical triad [4,5,17]. Previous studies revealed that most of untreated SEA patients undergo into four stages of the disease. Stage one present with fever, lumbar pain and local tenderness; stage two present with radicular pain, changes in the reﬂexes and nuchal rigidity; stage three consist of motor and sensory abnormalities and bowel and bladder dysfunction and in stage four, paralysis with permanent complication [2,12,13]. The diagnosis is established by history, clinical examination finding, increased inﬂammatory markers and neurological imaging [4,18]. Surgical decompression and drainage in combination with antibiotic for four to six weeks are the typical treatment for SEA [2-4,19-21]. An alternative treatment with parenteral antibiotic only was successful in specific population [6,22-26]. Hawkins et al., reported in their review of 11 pediatrics SEA that there is potential therapeutic success by using systemic antimicrobial treatment in combination with minimally invasive drainage techniques, serial laboratory studies, and imaging in pediatric group . A 11-year-old girl was hospitalized in our hospital on August 2018. She had been well since she was born-there was no previous medical or surgical history and no previous hospital admission-until one week earlier, when she started to have fever, chest and back pain. There was being well since she was born and there was no previous medical or surgical history. She was seen in local health center and was managed as a case of upper respiratory tract infection conservatively. She was seen in another hospital as she was not feeling any improvement. She was investigated there and discharged on oral antibiotics with the impression of pneumonia. Two days later she was called as her labs showed positive culture methicillin-sensitive Staphylococcus aureus, neutrophilic leukocytosis and bilateral infiltrate in chest x-ray. She was examined by our physician in the day of admission with fever, chest pain, lower back pain and lower limbs weakness. Birth and development history were unremarkable. Past medical was unremarkable. At hospitalization, she was febrile with temperature of 39C, pulse 111/min, respiration 36/min. She looked well-nourished but lethargic. The positive findings included crepitations in both lung fields, tenderness in lumbar spinal region, unsteady gait and lower extremity weakness with power 4 right side and 3 in the left. Planter flexion 1/5 in both side. Her white blood cell 15,500/100ml3, absolute neutrophil count 10 and C-reactive protein 500mg/L. Urine analysis was unremarkable. Repeated blood cultures taken. Lumbar puncture was not performed as parent were totally refusing this test. She was started on IV ceftriaxone 2 grams twice daily and 1 gram daily. Whole spine-MRI was performed and showed heterogeneous enhancing collection in the posterior epidural space from the level of T2 vertebra to T10 vertebra (Figure 1). It measures 6mm in thickness causing compression and anterior displacement of the spinal cord with evidence of high signal at T9 and T10. Diffuse subcutaneous collection and edema noted in the posterior aspect of the lumbar spine. During the period of admission, she was improving clinically and the inflammatory markers were decreasing. In the third day following antibiotics, her weakness started to improve. She retained back to her baseline by day eight. Following MRI after 3-weeks form initiation of treatment was done (Figure 2). She continued the same antibiotic for six weeks. She was discharge home clinically and vitally stable with follow up after 4 weeks in the clinic. Spinal infections are uncommon but significant causes of morbidity and hospitalization in the pediatric population . Spinal Epidural Abscess (SEA) is a rare condition that requires prompt diagnosis and initiation of treatment for optimal outcome . The incidence of spinal epidural abscess appears to be increasing and comprises up to 2 per 10,000 hospital admissions . Diagnosis is particularly challenging in patients who present with sepsis of unexplained origin; any complaint of back or neck pain should be urgently investigated with a MRI [30-33]. Risk factors for SEA include diabetes, malignancy, dialysis-dependent chronic renal disease, AIDS, and steroid use, immunosuppression and previous epidural procedures. Despite a low incidence of SEA, clinicians must maintain low thresholds of suspicion for spinal epidural abscess to diagnose and treat prior to development of irreversible deficits . As found in our case, Staphylococcus has been the most frequently causative organism for spinal epidural abscess which represents 63% of the cultured organisms . MRI is the study of choice for detecting spinal epidural abscesses . CT-myelogram are equivalent in their sensitivities to SEA in patients with contraindications for gadolinium enhanced MRI. Therapy for spinal epidural abscess therefore focuses on 3 goals: Preservation of normal neurologic function, prevention of worsening of existing neurologic deficits, and optimization of opportunities for improvement and return of function . Urgent surgical decompression has been the treatment of choice for spinal epidural abscess, and this has been confirmed in numerous series to date [34-39]. Appropriate intravenous antibiotics are administered for 4 to 6 weeks [35,36]. Pediatric cases raise concerns regarding development of post-laminectomy kyphosis . Alternative surgical techniques (e.g., laminotomy)  and percutaneous drainage  may address this issue. Several investigators, both in case reports [43,44] and in case series [45-47], have advocated antibiotic therapy alone for SEA cases. In a recent series of 75 cases of spinal epidural abscess , 22 (29%) patients were treated conservatively. In our case, antibiotic therapy alone was used as treatment strategy. Including our report, we found a total of 24 pediatric SEA cases without predisposing factors, 12 were males and 12 were female, age range 16 days-17 years (Table 1). Most cases presented with fever and non-specific symptoms including neck and back pain, vomiting and irritability. Two cases were initially diagnosed with acute appendicitis. Lumbar puncture was done in 8 cases only, 1 case had normal LP results. In 8 cases, blood culture was done as part of patient initial workup. Staphylococcus aureus was the most common cause of SEA (n=14) [Methicillin-sensitive Staphylococcus aureus 45.8%, Methicillin-resistant Staphylococcus aureus 8.3%]. Surgical intervention was done in 14 cases; 11 had laminectomy and 3 drainage of the SEA. Ten cases received conservative management with antibiotics only. Seventy-nine percentage of cases received combination for more than one antibiotic agent based on culture and sensitivity. The average of therapy duration was 6 weeks. In four cases the duration was not specified. Spinal Epidural Abscess (SEA) is a rare condition that requires prompt diagnosis and initiation of treatment for optimal outcome. Despite a low incidence of SEA, clinicians must maintain low thresholds of suspicion for spinal epidural abscess to diagnose and treat prior to development of irreversible deficits. MRI is the study of choice for detecting spinal epidural abscesses. Therapies for spinal epidural abscess focus on 3 goals: Preservation of normal neurologic function, prevention of worsening of existing neurologic deficits, and optimization of opportunities for improvement and return of function. Verbal and written informed consent was taken from patient parent. The authors of this study express their deep thanks and gratitude to the patient presented in this report and to her parents for their understanding, support and cooperation they showed during the conduct of the paper. Suppiah S, Meng Y, Fehlings MG, Massicotte EM, Yee A, et al. (2016) How best to manage the spinal epidural abscess? A Current systematic review. World Neurosurg 93: 20-28. Vergori A, Cerase A, Migliorini L, Pluchino MG, Oliveri G, et al. (2015) Pediatric spinal epidural abscess in an immunocompetent host without risk factors: Case report and review of the literature. IDCases 2: 109-115. 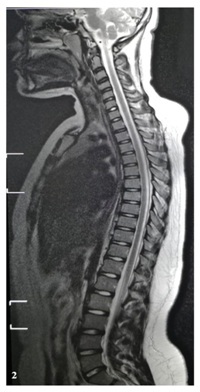 Harris TJ, Seamon JP (2014) Spontaneous spinal epidural abscess in a 21-month-old child. The American Journal of Emergency Medicine 32: 1558. Hawkins M, Bolton M (2013) Pediatric spinal epidural abscess: A 9-year institutional review and review of the literature. Pediatrics 132: 1680-1685. Rigamonti D, Liem L, Sampath P, Knoller N, Namaguchi Y, et al. (1999) Spinal epidural abscess: Contemporary trends in etiology, evaluation, and management. Surg Neurol 52: 189-196. Wheeler D, Keiser P, Rigamonti D, Keay S (1992) Medical management of spinal epidural abscesses: Case report and review. Clin Infect Dis 15: 22-27. Aycan A, Aktas OY, Guzey FK, Tufan A, Isler C, et al. (2016) Rapidly progressive spontaneous spinal epidural abscess. Case Reports in Infectious Diseases Pg no: 1-4. Vilke GM, Honingford EA (1996) Cervical spine epidural abscess in a patient with no predisposing risk factors. Ann Emerg Med 27: 777-780. Tang HJ, Lin HJ, Liu YC, Li CM (2002) Spinal epidural abscess--experience with 46 patients and evaluation of prognostic factors. J Infect 45: 76-81. Tunkel AR (2010) Subdural empyema, epidural abscess and suppurative intracranial trombophlebitis. In: Mandell GL, Bennet JE, Dolin R (eds.). Principle and practice of infectious diseases, (7th edn). Philadelphia: Elsevier, Netherlands. Pg no: 1281- 1283. Sendi P, Bregenzer T, Zimmerli W (2008) Spinal epidural abscess in clinical practice. QJM 101: 1-12. Karikari IO, Powers CJ, Reynolds RM, Mehta AI, Isaacs RE (2009) Management of a spontaneous spinal epidural abscess: A single-center 10-year experience. Neurosurgery 65: 919-923. Darouiche RO (2006) Spinal epidural abscess. N Engl J Med 355: 2012-2020. Shulman JA, Blumberg HM (1991) “Paraspinal andspinal infections,” in Infections of the Central Nervous System, Lambert HP (edn.). BC Decker, Philadelphia, USA. Zimmerer SM, Conen A, Müller AA, Sailer M, Taub E, et al. (2011) Spinal epidural abscess: Aetiology, predisponent factors and clinical outcomes in a 4-year prospective study. Eur Spine J 20: 2228-2234. Chen WC, Wang JL, Wang JT, Chen YC, Chang SC (2008) Spinal epidural abscess due to Staphylococcus aureus: Clinical manifestations and outcomes. J Microbiol Immunol Infect 41: 215-221. Pradilla G, Nagahama Y, Spivak AM, Bydon A, Rigamonti D (2010) Spinal epidural abscess: Current diagnosis and management. Curr Infect Dis Rep 12: 484-491. Auletta JJ, John CC (2001) Spinal epidural abscesses in children: A 15-year experience and review of the literature. Clin Infect Dis 32: 9-16. Walter RS, King JC Jr, Manley J, Rigamonti D (1991) Spinal epidural abscess in infancy: Successful percutaneous drainage in a nine-month-old and review of the literature. Pediatr Infect Dis J 10: 860-864. Darouiche RO, Hamill RJ, Greenberg SB, Weathers SW, Musher DM (1992) Bacterial spinal epidural abscess. Review of 43 cases and literature survey. Medicine (Baltimore) 71: 369-385. Siddiq F, Chowﬁn A, Tight R, Sahmoun AE, Smego RA Jr (2004) Medical vs surgical management of spinal epidural abscess. Arch Intern Med 164: 2409-2412. Sethna NF, Clendenin D, Athiraman U, Solodiuk J, Rodriguez DP, et al. (2010) Incidence of epidural catheter-associated infections after continuous epidural analgesia in children. Anesthesiology 113: 224-232. Leys D, Lesoin F, Viaud C, Pasquier F, Rousseaux M, et al. (1985) Decreased morbidity from acute bacterial spinal epidural abscesses using computed tomography and nonsurgical treatment in selected patients. Ann Neurol 17: 350-355. Tyagi R (2016) Spinal infections in children: A review. J Orthop 13: 254-258. Torgovnick J, Sethi N, Wyss J (2005) Spinal epidural abscess: Clinical presentation, management and outcome (Curry WT, Hoh BL, Hanjani SA, et al. Surg Neurol 2005;63:364-71). Surg Neurol 64: 279. Beaudooin MG, Klein L (1984) Epidural abscess following multiple spinal anaesthetics. Anaesth Intensive Care 12: 163-164. Burstal R, Wegener F, Hayes C, Lantry G (1998) Epidural analgesia: Prospective audit of 1062 patients. Anaesth Intensive Care 26: 165-172. Du Pen SL, Peterson DG, Williams A, Bogosian AJ (1990) Infection during chronic epidural catheterization: Diagnosis and treatment. Anethesiology 73: 905-909. Reihsaus E, Waldbaur H, Seeling W (2000) Spinal epidural abscess: A metaanalysis of 915 patients. Neurosurg Rev 232: 175-204. Corboy JR, Price RW (1993) Myelitis and toxic, inflammatory, and infectious disorders. Curr Opin Neurol Neurosurg 6: 564-570. Ingham HR, Sisson PR, Mendelow AD, Kalbag RM (1991) Pyogenic neurosurgical infections. London7 Edward Arnold. Krauss WE, McCormick PC (1992) Infections of the dural spaces. Neurosurg Clin N Am 3: 421-433. Martin MJ, Yuan HA (1996) Neurosurgical care of spinal epidural, subdural, and intramedullary abscesses and arachnoiditis. Orthop Clin North Am 27: 125-136. Soehle M, Wallenberg T (2002) Spinal epidural abscess: Clinical manifestations, prognostic factors, and outcomes. Neurosurgery 51: 79-85. Fischer EG, Greene Jr CS, Winston KR (1981) Spinal epidural abscess. Neurosurgery 9: 257-260. Schlossberg D, Shulman JA (1977) Spinal epidural abscess. South Med J 79: 669-673. Bouchez B, Arnott G, Delfosse JM (1985) Acute spinal epidural abscess. J Neurol 231: 343-344. Messer HD, Lenchner GS, Bruit JCM, Resas S (1977) Lumbar spinal epidural abscess managed conservatively. J Neurosurg 46: 825-829. Hanigan WC, Asner NG, Elwood PW (1990) Magnetic resonance imaging and the nonoperative treatment of spinal epidural abscess. Surg Neurol 34: 408-413. Mampalam TJ, Rosegay H, Andrews BT, Rosenblum ML, Pitts LH (1989) Nonoperative treatment of spinal epidural infections. J Neurosurg 71: 208-210. Bair-Merritt MH, Chung C, Collier A (2000) Spinal Epidural Abscess in a Young Child. Pediatrics 106: 39. Tang K, Xenos C, Sgouros S (2001) Spontaneous spinal epidural abscess in a neonate. With a review of the literature. Childs Nerv Syst 17: 629-631. Flikweert E, Postema R, Briel J, Lequin M, Hazebroek F (2002) Spinal epidural abscess presenting with abdominal pain. Eur J Pediatr Surg 12: 141-143. Kiymaz N, Demir Ö (2005) Spontaneous cervical paraspinal and epidural giant abscess in a child--case report--. Neurol Med Chir 45: 540-542. Mantadakis E, Birbilis T, Michailidis L, Souftas V, Chatzimichael A (2011) Spinal epidural abscess in a young girl without risk factors. Eur J Pediatr 170: 945-948. Rook JL, Duffey D, DeRoos S (2011) A case of autonomically mediated pain due to spinal epidural abscess in an adolescent female. Pediatr Emerg Care 27: 530-532. Fotaki A, Anatoliotaki M, Tritou I, Tzagaraki A, Kampitaki M, et al. (2019) Review and case report demonstrate that spontaneous spinal epidural abscesses are rare but dangerous in childhood. Acta Paediatr 108: 28-36. Horner K, Yamada M, Zuccoli G, Rosenberg S, Greene S, et al. (2016) A 34-day-old with fever, cerebrospinal fluid pleocytosis, and Staphylococcus aureus bacteremia. Pediatrics 137. Paro-Panjan D, Grcar LL, Pecaric-Meglic N, Tekavcic I (2006) Epidural cervical abscess in a neonate. Eur J Pediatr 165: 730-731. Pathak A, Singh P, Gehlot P, Dhaneria M (2013) Spinal epidural abscess treated with antibiotics alone. BMJ Case Rep 30. Sales JG, Tabrizi A, Elmi A, Soleimanpour J, Gavidel E (2013) Adolescence spinal epidural abscess with neurological symptoms: Case report, a lesson to be re-learnt. Med J Islam Repub Iran 27: 38-41. Hazelton B, Kesson A, Prelog K, Carmo K, Dexter M (2012) Epidural abscess in a neonate. J Paediatr Child Health 48: 132-135. Kim MC, Jung HT (2011) Pediatric lumbar epidural abscess combined with cauda equina syndrome: Case report. Asian Spine J 5: 133-137. Shawar R, Patamasucon P, Rowles S (2017) Case 2: Fever and back pain in 13-year-old girl. Pediatr Rev 38: 46-47. Raus I, Tatar S, Coroiu R (2015) Diagnostic use of Magnetic Resonance Imaging (MRI) of a cervical epidural abscess and spondylodiscitis in an infant-case report. Clujul Med 88: 555-559. Rood CJ, Whitefield JS, Hayek RA (2014) A 10-year-old boy with fever, sudden onset of lower back pain, and gait change. Pediatr Ann 43: 177-180. Prasad M, De Vere N (2014) Spinal epidural abscess masquerading as an acute abdomen. Pediatr Neurol 50: 540-541. Figure 1: Whole-spine T2-weighted magnetic resonance imaging with contrast extensive epidural collection extending from T2 to T10. Spinal cord is compressed anteriorly with normal signal. Figure 2: Whole-spine T1-weighted magnetic resonance imaging with contrast 3 weeks after parenteral antibiotic showing complete resolution of epidural abscess. Irritability, paresis and areflexia of both arms. Table 1: Summary of 24 cases of spinal epidural abscess in immunocompetent children published in literature. Citation: Tariq AS, Leena AS, Jawahir AS, Zakariya AA, Ali AS (2018) Spinal Epidural Abscess in Immunocompetent Child. J Brain Neursci 2: 005. Copyright: © 2018 Tariq AS, et al. This is an open-access article distributed under the terms of the Creative Commons Attribution License, which permits unrestricted use, distribution, and reproduction in any medium, provided the original author and source are credited.